Is Our Species Decaying? | Why do we let ETs play Hide And Seek With Us? ALIEN PREDATORS – WOULD YOU PUT OUR EGGS IN THEIR BASKET? The Shroud of Turin is reputedly Christ's burial cloth. It has been a religious relic since the Middle Ages. To believers it was divine proof the Christ was resurrected from the grave, to doubters it was evidence of human gullibility and one of the greatest hoaxes in the history of art. No one has been able to prove that it is the burial cloth of Jesus of Nazareth, but its haunting image of a man's wounded body is proof enough for true believers. Contamination by a fire in 1532 that could have skewed the results by thousands of years. A difference detected in the dates of the different samples given to the three laboratories (in some cases as much as several hundred years). The fact that some parts of the sample appear to come from a fabric that was used to repair the cloth at a later date. If the Shroud of Turin was indeed created by the same phenomenon that allowed Jesus to ‘glow brighter than the sun’ in front of James, Peter and John, known as the ‘Transfiguration’ then the remarkable features that this cloth has been found to possess could have a clear explanation. Could this burst of laser-like radiation have been produced by the conversion of the very atoms of Christ’s body into light? If this was indeed the case it is no surprise that there is no laser powerful enough to deliver such a blast of radiation! Is it possible that through thought and behavior that binds and unites, in other words through that much misused word ‘love,’ Jesus Christ lessened the force of his own atoms such that their condensed energy was liberated in a blaze of transfiguration? I propose that E=MC² suggests that matter is in fact no more than energy in a frozen state and energy is no more than thought in a frozen state. If the God state is infinite in extent then it is a state of timelessness without beginning or end. All finite states must therefore have their beginning in this infinite state. If the fabric of that infinite state is thought then all finite states are therefore fashioned from thought. With this in mind let’s take another look at how the image on the Shroud might have been formed. The holographic properties of the Shroud are very important. A hologram is a pattern of interacting microscopic rings, or interference fringes, not unlike the pattern created when a handful of pebbles are tossed into a pond. Every area of the hologram sees and stores information about the whole image. If you break a hologram into multiple pieces, you have multiple holograms, each of which bears information about the whole image. information from photographs of the shroud at the Eindhoven holographic lab in Holland. This he found quite remarkable, as photographs do not usually contain holographic information. In addition, Dr. Soons made the surprising discovery that this three-dimensional holographic information could only be found in the actual image of the body. The images of plants and flowers and the bloodstains also imprinted on the shroud did not contain this information. Thus the process by which the image of the body itself was formed allowed somehow for the record of information in holographic form. Holograms are produced two beams of coherent laser light at right angles to eachother. I propose that the laser light that created this particular hologram was of the utmost coherence possible and that the two beams at right angles define the two dimensional extent of that which I refer to as the Godverse. In two dimensions limitless extent is possible, it is only once three dimensions occur that limit and fixture can begin. To return to Dr. Soons research, he is also trying to establish if each fiber of the shroud might contain holographic information of the whole image. In his preliminary research he has seen rings on the shroud to suggest that it could indeed be holographic at microscopic level. Could the fact that the image is formed on the surface fibers of both sides of the cloth without penetrating through the intervening layers suggest that Christ was able to be in two places at once from that interface? In other words the separation of points and therefore force and energy were no longer relevant for him. He had converted the atoms of his body to a form of ‘educated light,’ a light that had no component of force or energy to it. A light that held all the information about what and who he was with such purity and power it could create the living semblance of himself. In other words the form of himself that could account for the phenomenon we call the Resurrection. Could this form of educated light be what we call a soul? A mechanism we cannot yet quantify and qualify through science but nevertheless exists and accounts for the continuation of a personal living individuality past death. The Fabric of Time, Grizzly Adams Productions DVD (April 24, 2007). Giles F. Carter, “Formation of Images on the Shroud by X-rays: A New Hypothesis”, ACS Advances in Chemistry No. 205: Archaeological Chemistry, (1984) 425-446. Nigel Kerner's international family base provided a background for an obsessive and serious interest in international human affairs and in science and its interface with religion and philosophy in the contemporary world. He has felt driven, from his young years, to expose the humbug and hypocrisy in modern scientific and religious and social thinking. A fascination with the puzzling and enigmatic phenomenon of UFOs resulted in his first book THE SONG OF THE GREYS published by Hodder & Stoughton in 1997. A serious work on the subject now noted world wide for its radical view on the phenomenon. 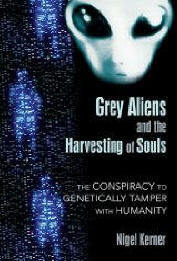 Much to the author's chagrin, many who have read the book consider him to be one of the world's foremost ufologists. Of all the humanoid alien types that feature in reports of sightings and abductions, the most common is "the Grey" - smooth and sallow-skinned, small in stature, spindly and thin. Who are they? Where do they come from? What do they want from us? They have programmed in to their intercepted lines of mankind all the mechanisms necessary to keep their experiments intact and functioning. Racism and tribalism are a case in point. What better way to keep experimental groups separate in order to avoid one experiment leaking into another and affecting the final result, than to programme separatism and tribal identity into the experimental subjects.